SYRACUSE, NY (WRVO) – Political ads are one of the battlefields in many of the crucial midterm races for Congress this year, and the race for central New York’s 24th Congressional District is no different. 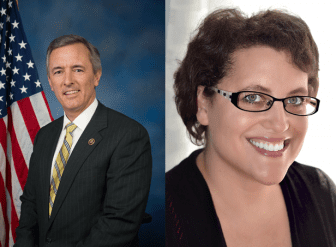 Political ads from Democratic challenger Dana Balter and incumbent Rep. John Katko (R-Camillus) are flooding local airways as Election Day approaches. One of the most controversial has been from the Katko camp, which accuses Balter of facing a tax lien when she lived in Florida. The ad says that Balter face a warrant for not paying her taxes, while living in a “mansion” in Naples, Florida. Media fact checkers have found some of the claims in the spot are exaggerated. For example, Balter lived in a condo with her brother during her time in Florida. But Katko defends the ad, noting that the fact she lived away from central New York is the point. Balter moved to Syracuse in 2003, but lived in family in Florida and Pennsylvania from 2007-2011 after suffering a concussion after a fall. Katko said negative ads are just part of politics. Balter said she has tried to keep her ads focused on the issues. “I do think it’s a challenge to maintain it. But that’s why I try to do it, because as a voter that’s what I want. And that’s what I hear from voters across the district who are sick of negative campaigning,” said Balter. She called Katko’s ads unfortunate.